Alma 33:22 is not the only place in the Book of Mormon where its seven principles of Nephite faith in Jesus Christ are revealed. Eight other important compact doctrinal passages list many, if not all, of these seven principles. Each of these passages is shown in the left-hand columns of this chart. To the right, check marks indicate which principles each passage includes. 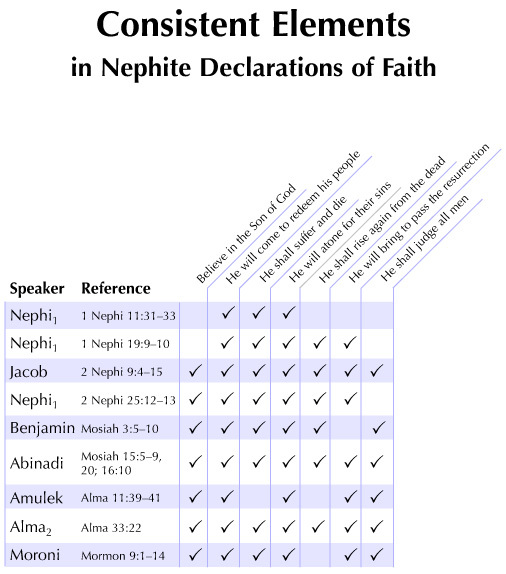 The consistency of expression found in these scriptures suggests that the seven principles in Alma's formulation may have constituted a widely taught and adopted declaration of faith established among the Nephites.